November 4, 2011 - The only airport serving Nashua, NH has kicked off construction of a new, 6,000-foot runway to increase the safety and range capabilities of business airplanes. The occasion has prompted local officials to point up the economic benefits the airport provides, and the role of the new runway in attracting more business investment and activity. ?Business that flows through our airport is worth some $28 -$30 million annually for the region,? said Chris Williams, President and CEO of the Greater Nashua Chamber of Commerce. And there are roughly 300 jobs directly connected with it. 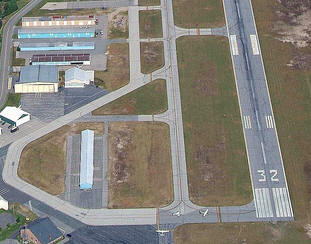 Between employing people and its economic impact, the airport itself is one of the major economic engines in Nashua.? The airport is just three miles from Nashua?s thriving central business district, along NH Route 101A, and officials estimate that about 45 jobs will be needed during the runway construction phase. At Monday?s kickoff ceremony, Nashua Mayor Donnalee Lozeau said the airport improvement, which will be finished next fall, was ?quite a blessing? for the community, and U.S. Representative Charlie Bass (R-NH-02) told attendees that the airport is ?a centerpiece for aviation and this economy [and] will have an impact on the viability of the economy of this entire region. About 60 federal, state and local officials attended the kickoff. The new $16 million runway, 14/32, will be constructed parallel to the existing 5,500 foot runway and will replace the old runway. The extra 500 feet will allow larger business airplanes to depart with more fuel for longer initial legs, as well as giving a greater safety margin on hot days. It will also bring the airport into compliance with current FAA standards for runway-taxiway separation. Boire Field was named for Nashua?s Ensign Paul Boire, who was the city?s first casualty in World War II, according to airport director Roy Rankin, Jr.. The airport was built in 1934 and now supports almost 75,000 takeoffs and landings a year. Airline passenger service is available from the Manchester-Boston Regional Airport, about 15 miles north of Nashua, and from Boston-area airports. About 30 aviation-related businesses are thriving at Boire Field, including three flight schools, one offering instruction in helicopters. Rankin said business airplanes from national companies land every day to conduct business in the Nashua area, and Dartmouth-Hitchcock Advanced Response Team (DHART) flights transporting critically ill patients to and from the local hospitals are common. The Nashua airport has hundreds of based aircraft including 17 business aircraft and many single- and twin-engine piston aircraft. Construction of the new runway is being funded by the FAA Airport Improvement Program (AIP) the New Hampshire Department of Transportation and the Nashua Airport Authority.